The T-Mobile Galaxy Note 3 Android 4.4.2 update has already been rolled out starting March 5 until April 11, 2014. The software update will not be pushed to your phone but you could request for it. Your Note 3 will notify you if it's ready to download the update over the air (OTA). Look for System manager section and tap About device. If you're seeing N900TUVUCNB4 baseband, then your phone is already updated and you don't need to do a thing anymore. 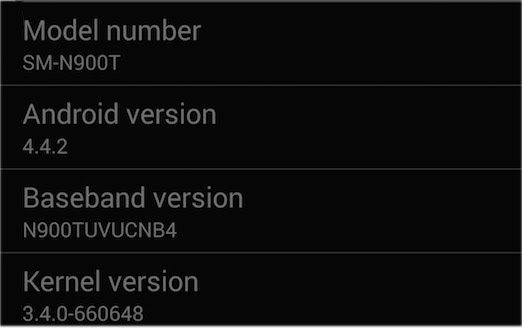 However, if you're seeing N900TUVBMI7 baseband, then you need to take some action to update your Note 3. You T-Mobile Galaxy Note 3 should, at least, have 50% battery left. You must be connected to a stable Wi-Fi network because any interruption during the download may cause the package to become corrupt and you'll face a lot of problems once the update is installed. Your phone must, at least, have 510MB storage left. The Android 4.4.2 KitKat update will bring a lot of goodies for the Galaxy Note 3 not to mention fixing the bugs experienced by many owners with their current firmware. I can't say it's a must-have update but I would strongly recommend you update your phone the soonest time possible. In case you have questions, feel free to ask us via sebertech@gmail.com. Thank you.